Sphinn allows you to get the latest news from the SEM industry using not a single source but a diversity of sources, including some that aren’t very popular (yet). I don’t know what about you, but if you’re anything like me, I guess you got used to get your SEM reading mainly from one big source, such as search engine land for example. With Shpinn you can get a lot of worthy news items from different sources which is more than just refreshing. Assuming you’re not one of those who live by the “time is money” phrase, by participating in Sphinn, especially via submitting news stories you wrote yourself, there’s a big chance you can get some free (and quite targeted) traffic to your blog or business site. Submitted stories at Sphinn can get to the “hot topics” (thus presented at the main page) list even with just a few votes such as a little bit higher than twenty. 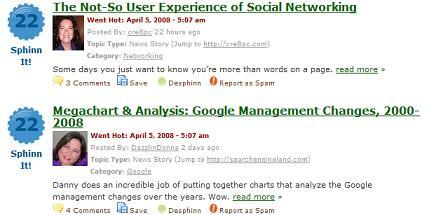 This entry was posted on Saturday, April 5th, 2008 at 5:39 pm and is filed under SEM, SEO. You can follow any responses to this entry through the RSS 2.0 feed. You can leave a response, or trackback from your own site. Anyway, I guess I’ll see you around Sphinn! I’ve found the community more open, than say that of Digg, and as you mention it’s a great resource for staying up to date. What I find particularly interesting is the different opinions and discussions on subjects, and getting a broader understanding on topics, where SEO/SEM/Analytics interlink.